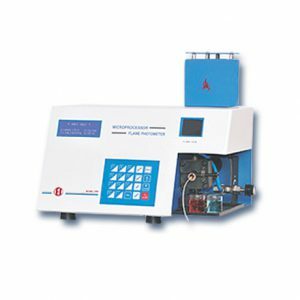 Microprocessor Flame Photometer – 1385 & 1382 | Electronics India - Manufacturer, Supplier and Exporter of Analytical, Scientific Laboratory and Pharmaceautical Instruments in India. Microprocessor Flame Photometers – 1385 & 1382 comes with Flame Failure detection and Auto Gas Cutoff Facility. In case of power failure, the gas cuts off automatically. In case the flame goes off accidently during work, the flame failure alarm sounds after a few seconds. Both Microprocessor Flamephotometers Model 1385 & Model 1382 are used for the determination of Sodium, Potassium, Calcium, Lithium & Barium. They uses the latest microcontroller technology and advanced engineering techniques so as to give enhanced accuracy and reproducibility. They have soft touch membrane keys for ease of operation. The solution is aspirated through an atomizer. Air, sample and the fuel are mixed in the mixing chamber which is then sprayed as a very fine mist into the flame. Radiations from the flame passes through a specific narrow band interference filter and pass to the photo-detector. The final results are displayed on the 20 x 4 alphanumeric LCD. The standard model comes with 2 filters (Na & K). Additional filters Ca & Li are optional at extra cost. In both the models, Calibration can be done with up to 25 standards of user choice(5 point for each element) and non-linearity correction is provided through an automatic curve fitting software. Multiple Calibration Curves can be stored in the memory. Facility has been provided for re-standardization with a single standard, thereby, eliminating the need of multiple standards once a calibration has been performed.